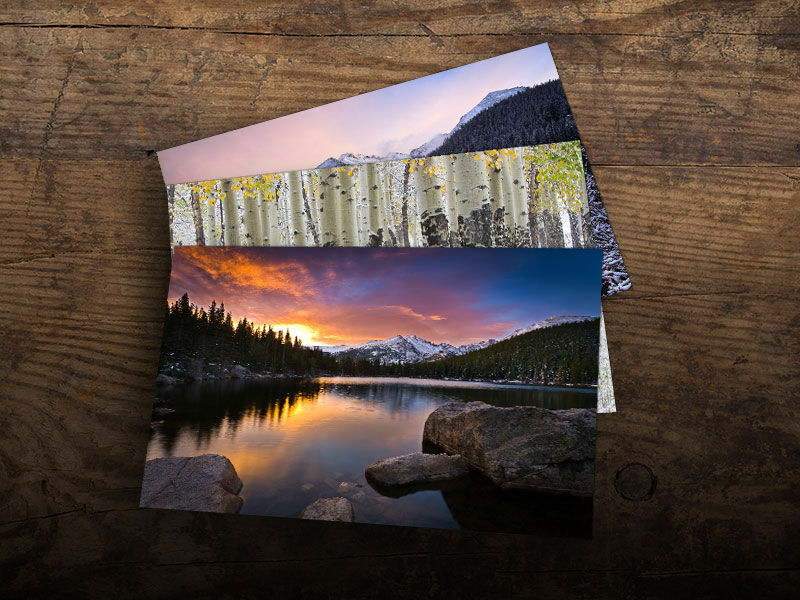 Bring the beauty of RMNP into your home or office. There are hundreds of images available on this website so you are sure to find one that stirs your soul or reminds you of that special trip. These prints come in a variety of sizes to fit every space and every need. They also make great gifts. If you are curious what customers are saying about our prints, check out the comments about us on TripAdvisor.com. You can order prints in various formats such as print only, plaque mounted, plaque on plaque, matted plaque, and canvas. These are all shipped free of charge anywhere in the Continental United States when your order totals $200 or more. Sales tax is only charged for orders inside of Colorado. The print only option is the most affordable route to go. It is just what it sounds like: prints on high quality archival photographic paper without any mounting or framing. One of the benefits of going this route is that you can bring them to your local frame shop to have them matted and framed exactly as you like. Prints are also great if you are in a hurry as they usually arrive in 5-7 days from the time of order. For many years we offered prints matted behind a suede mattboard. While they provided an affordable price point, they needed to be put behind glass to properly display them, but this took so much away from the aesthetic experience. So, we now offer a new product which we are calling a "matted plaque". It comes in the same sizes and looks very much like our matted prints, but now no longer requires glass to protect the print. This new product has a lot more dimensionality as well since the print portion is actually raised off of the matboard. We think you are going to like it. It is a much higher quality product and costs us quite a bit more to produce, but we've kept the price fairly close to our previous matted print pricing. It therefore works out to be a very good deal for you and is a product we are proud of. Our matted plaques are created to standard sizes (8x10, 11x14, 16x20) so that pre-made frames can be purchased affordably from stores like Target, Michael's, Hobby Lobby, etc. Matted plaques are custom made when you place an order and so you can expect it to take about 2-3 weeks from the time you order until the time you receive it. This mounting option is by far our most popular format. It is both durable and beautiful. It allows the images to reveal an almost three dimensional quality creating the impression of actually being there. This is because there is almost no glare or reflection such as you find with even the most expensive types of glass. An additional benefit is that the artwork is very durable and can even be cleaned with a soft damp cloth. The artwork also resists fading because it has UV protection. When you order a plaque from us, they arrive ready to hang. Most people like the clean modern look, but occasionally people will choose to put a frame on them to match their home decor. 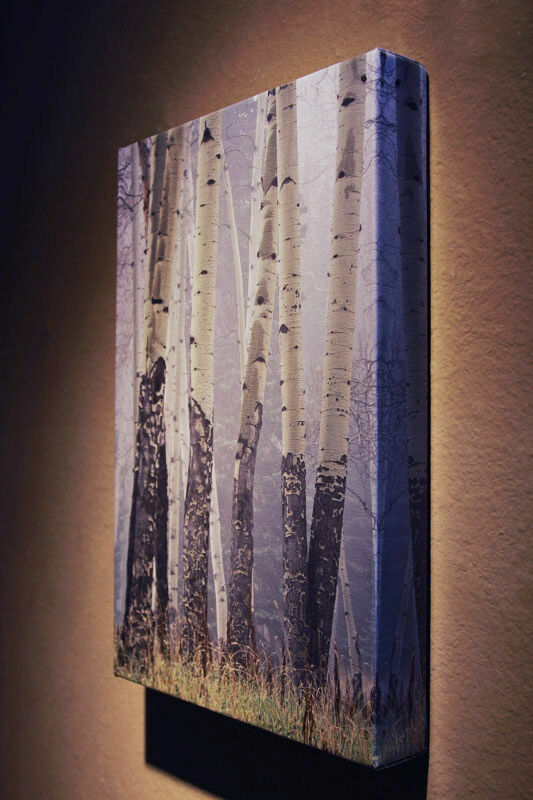 Plaques begin with a fine art archival photographic print. 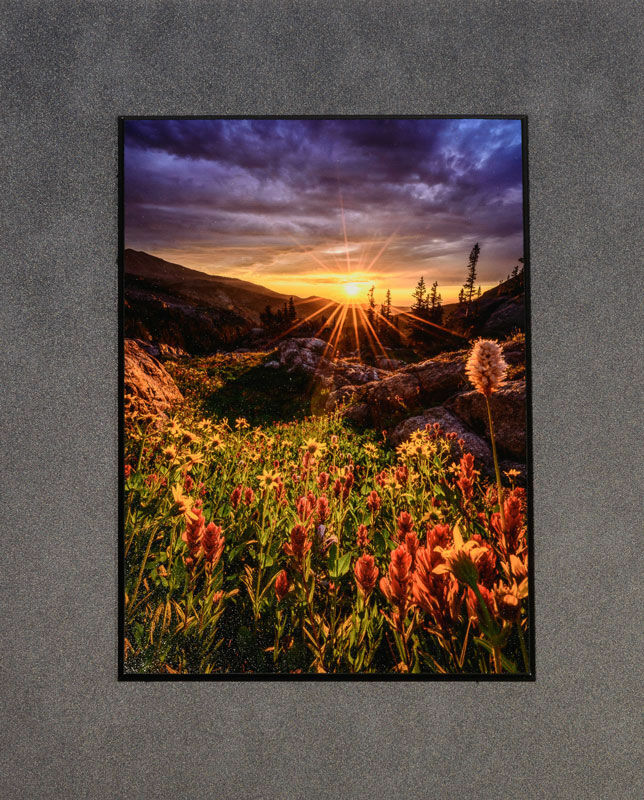 A special sheet of UV protective laminate designed for fine art prints is applied to the top of the print protecting it from dust, sunlight, fingerprints, etc. It is a very special product that is imported from England. The laminated print is then adhered to a recycled and environmentally friendly 3/8" MDF wood background which has first been sealed in a plastic film to avoid any humidity issues and create a product that will last for a lifetime. The edges are then sealed with a black trim. The finished piece then hangs on the wall using a French cleat which is a hanging system often used with cabinetry and ensures that the piece is secure and always straight. 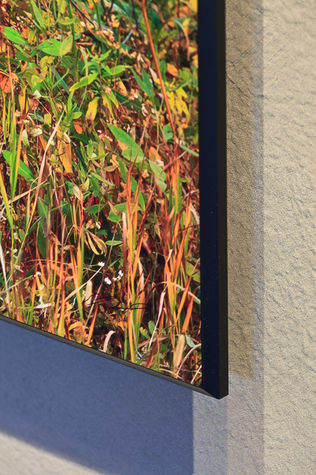 With this option, the image stands off the wall about 3/4" creating a floating appearance. When the prints are mounted in this way it creates a very modern and professional feel. The standard plaques generally work best in contemporary settings but we also have other options for a more traditional look. When ordering a plaque realize that since there is no matting or frame, the print size is the same as the final size of the piece. It typically takes 3-4 weeks from the time an order is placed until it is shipped. This is a great way to make your plaque stand out, particularly if you have a wall color that is similar to the image. What we do is create another plaque, completely black, which is larger than the picture plaque. This large back plaque floats off your wall using a French Cleat. Then, the picture plaque is attached to the back plaque with another French Cleat. The result is a very three-dimensional feel as the photo seems to float off of the back plaque which itself is floating off of the wall. This is a great way to create a centerpiece image as it always attracts a lot of attention. I generally have one of these right as you come into the door in my gallery. Another nice feature of this format is that it is designed in such a way that you can easily switch photo plaques in and out while the back plaque stays in place. 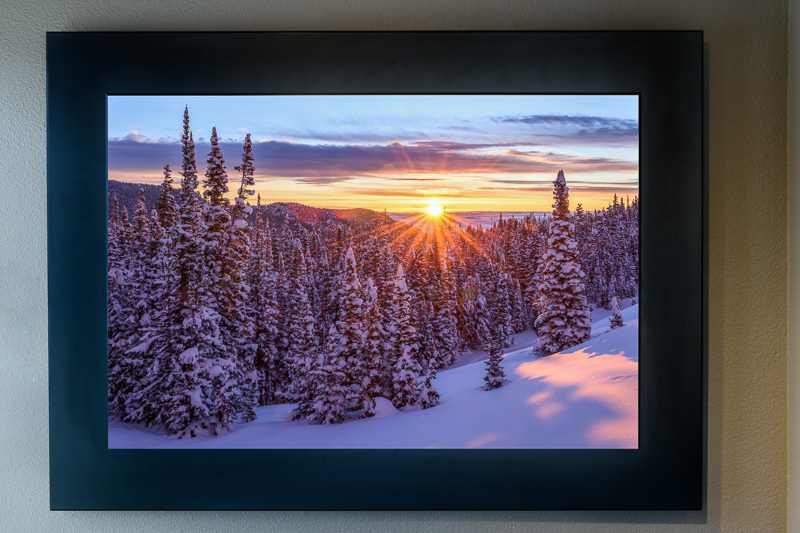 So, if you want to put a different photo on display during the winter it will only take you a few seconds to switch them out. These cost quite a bit more than the normal plaques because they actually cost more to produce than the photo plaques and because of their weight, they are very expensive for us to ship. If you are able to pick up your plaque on plaque in Longmont when it is produced, we may be able to provide you with a discount. These pieces take about 5-6 weeks to produce and deliver. One of the most popular and attractive formats that we offer in our gallery is what we refer to as our "modern classic format". With this format we actually mat and frame the plaque to create a more traditional feel. Unfortunately, we can't offer this option for sale on the website because it is too difficult to show you the many different frame options we have to choose from. 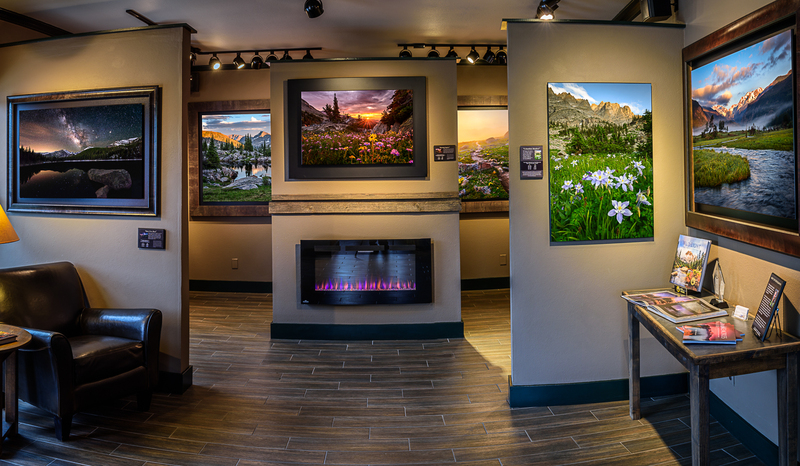 You'll need to stop into our gallery in Estes Park or Grand Lake and let us walk you through the options. Packing and shipping within the lower 48 United States is now free of charge for orders over $200! For other locations contact us for a quote. Most of our shipping is done via FedEx Ground or UPS Ground. For very large pieces we will often use a company which specializes in delivering art. Prints can be ordered directly from the individual image pages. 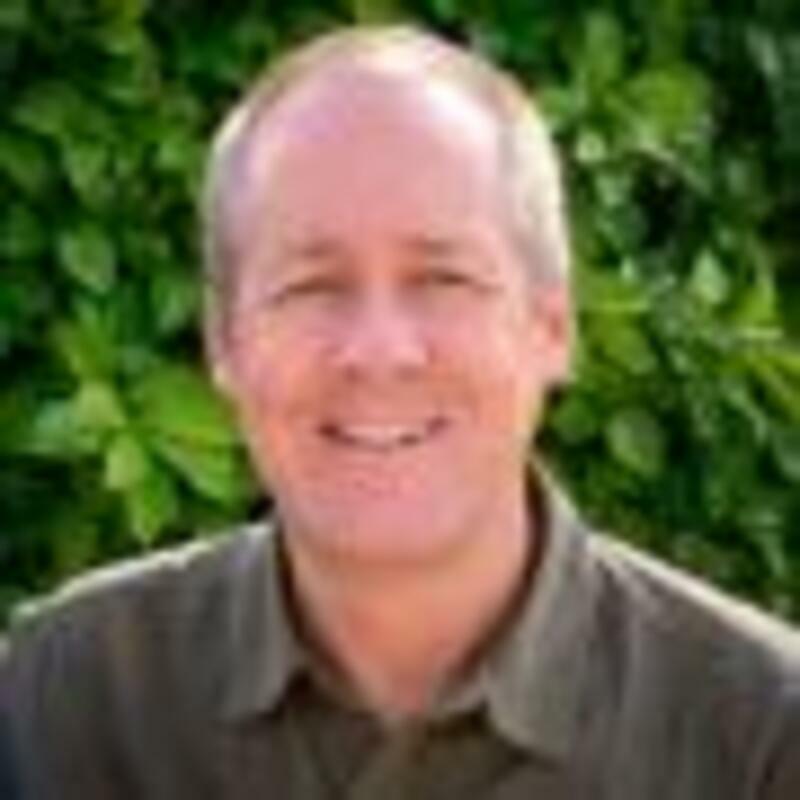 The website processes the orders via PayPal. You don't need a Paypal account though. Simply click the link: "Don't have a Paypal Account" and it will let you pay directly via credit card. 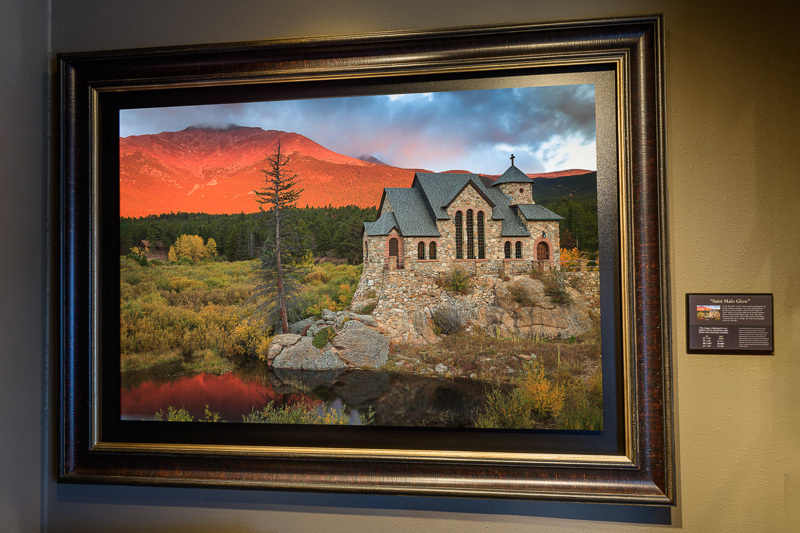 Alternatively, you can always call us and place your order with one of our staff members in our Estes Park gallery at: 970-586-4352. We are committed to providing you with wonderful service and high quality products. If you are not completely satisfied with your order simply contact us within a week of receiving it and let us know. You can rest assured that we will treat you right. We will work with you to ensure your satisfaction and will readily provide a replacement or refund (not including shipping). You can order from us knowing that if you aren’t happy with your order then neither are we. We have years of experience and thousands of happy customers. We look forward to having you join them.